Second graders in Karen Anderson's classroom work with Reading Specialist Donna Cullivan, learning a poem from a big sheet of paper on an easel. Their hotel room classroom has a kitchenette and bathroom, but no chalkboard or whiteboard on the wall. The students in kindergarten through fifth grade are a few miles away, in a former strip mall hotel at the Morrisville Plaza. 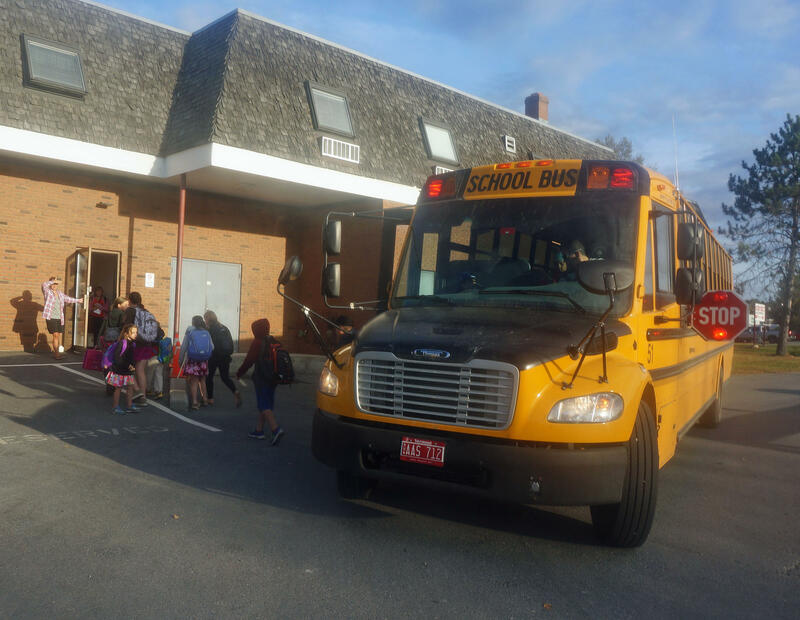 Sixth graders have a classroom at the Green Mountain Technology and Career Center, on the Lamoille Union Middle and High School Campus. Preschoolers are at various programs around Lamoille County. Principal Diane Reilly says it’s been an adventure. "It could have been stressful," she says. "It was a little stressful, but for the most part it was more exciting and an adventure. And that’s how we’ve looked at it, as an adventure." Some classrooms at the Plaza are quite small – just your average size hotel room. Other classrooms are converted suites, with a living area and a kitchen. And some classrooms are carved out of large conference rooms. There isn’t much space for desks, so a lot of work gets done on clipboards. The rooms are all carpeted, which makes sitting on the floor pretty comfortable, and it helps keep the noise down too. 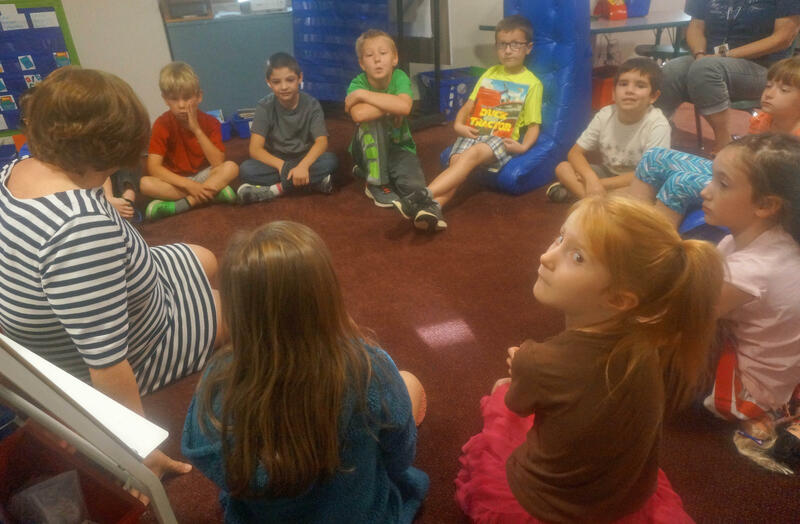 Second graders in Terri Ayers' classroom have circle time on the carpeted floor. There aren’t any chalkboards, whiteboards or smartboards on the walls, so the teachers use easels with big pads of paper. Meals are prepared at Lamoille Union High School and delivered to students in their classrooms. Room service, if you will. The second graders in Karen Anderson’s classroom say there are plusses and minuses to going to school in a hotel. They like that they have a kitchen in their classroom, including a mini fridge. They also like the air conditioning. School buses drop students off at the back door to the former hotel, away from the strip mall's parking lot traffic. They don't have a fancy playground with climbing structures like back at the elementary school building. Their playground is just a fenced-off patch of grass behind the hotel. But teachers say that has led to more imaginative play. Students bring in toys from home. They make up games with orange traffic cones and portable soccer nets. Principal Reilly says, while it has been an adjustment, the hotel is a big improvement over a crumbling school building. "It was pretty bad," she says. "We had ceilings falling in. We had the roof that was going to need replacement. We had one boiler left. We couldn’t regulate the temperature anywhere in the building." Principal Diane Reilly greets students as they file into the hotel lobby. 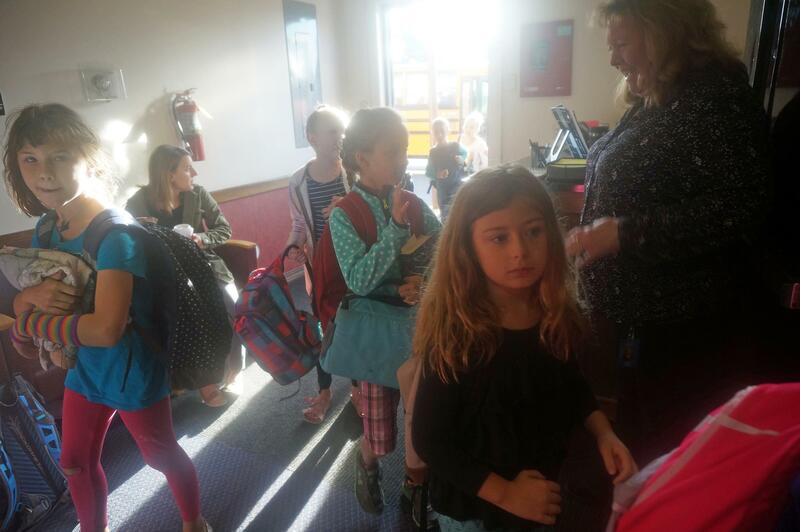 "Hyde Park Elementary School is like a Vermont farmhouse," she says. "You have a small family and then you have kids and then grandchildren, and so you add something on. So, I had the 1898 wing, the 1951 wing, the 1984 wing, the 1994 wing." Reilly says the school gym wasn’t even built to any school specs. It was built as a set for the 1988 movie "Sweet Hearts Dance" which was shot on location in Hyde Park. The original 1898 building is on the left and the gym is on the right, but the middle section of the Hyde Park Elementary School has been removed. Construction is expected to last well into the spring. She says passing a construction bond wasn’t easy, especially since there is no more state aid for school construction projects. "Vermont schools are just in a bad repair, a lot of them, especially the rural schools," she says. "And there’s no money from the state – absolutely none for construction. So we were very fortunate to get a bond in Hyde Park." After years of debate, voters in Hyde Park approved $9.8 million dollars to renovate the school building. The 1951 wing has now been torn down and three stories of new construction are going up. 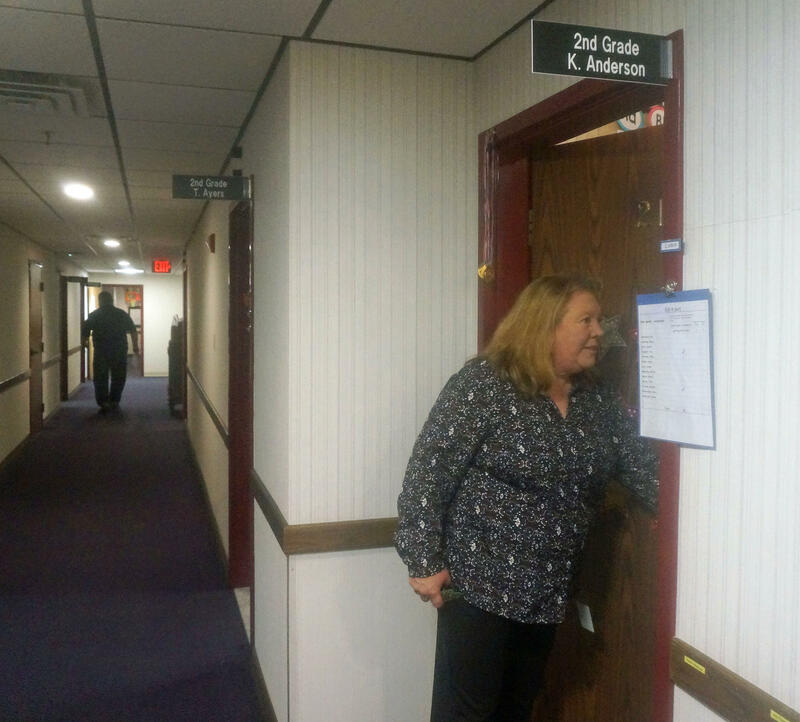 Principal Diane Reilly peeks into a second grade classroom from a hallway which still looks more like a hotel than a school. The town is paying $200,000 dollars to rent the Plaza Hotel and two storefronts for the school year. One storefront houses the before- and after-school programs and the other is a kindergarten classroom. And while it’s been a logistical challenge, Reilly says school in a hotel has been a rewarding experience so far. In fact, she says, "Everybody should have to do this." The Plaza Hotel shut its doors eight years ago. 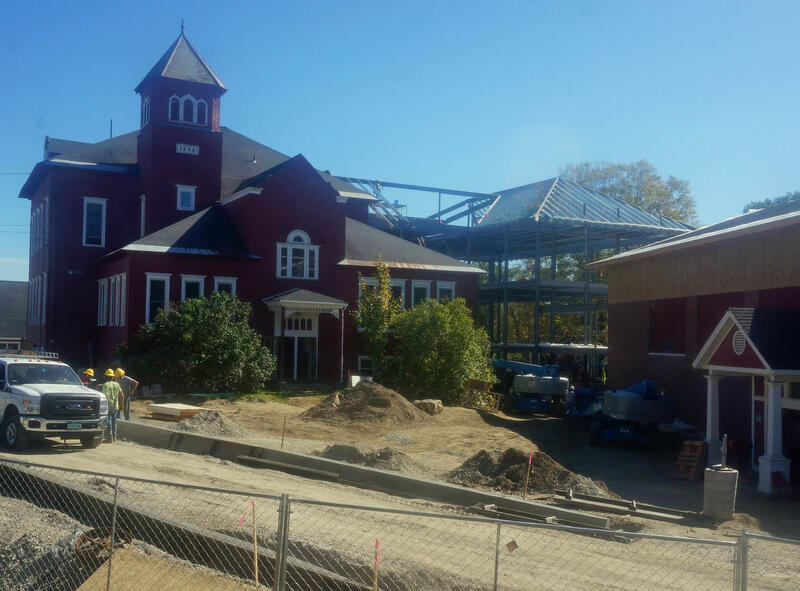 It was empty until last year, when another Hyde Park institution – the Lamoille County Courthouse – underwent renovations. First court was held at the hotel, and now school. One can only imagine what will be there next. As high school seniors are working away on their college applications, administrators at Johnson State College and Lyndon State College are gearing up to select the first freshman class of Northern Vermont University. Under cover of darkness, someone took to the back roads of Glover last week to spread messages of hate. Since then, the community response has been both swift and broad.